Waimea is a free standalone open-source chronogram editor (Github page). Its aim is to provide a way to produce clear waveform sheets from simple text difinitions and intuitive controls. It was inspired by Wavedrom. It can be run on Windows XP and later, and also easily on Linux through Wine. No installation required. It is currently written in VB6, but plans are being made to move away from it. Speed isn't an issue, portability is. Rendering is done with OpenGL. 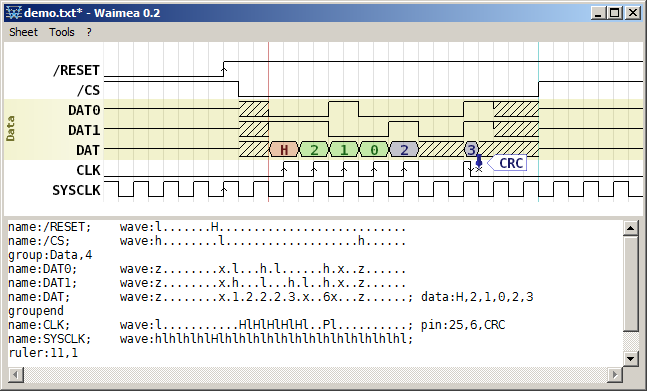 Pins are a way to anotate waveforms at precise times without cluttering the view. The text note pops up when the cursor is over the pin, and all notes in view can be seen by holding down the ALT key. They can be assigned colors. Navigation in large chronograms is simply done by drag scrolling. The name labels for each waveform are transparent and locked horizontally so they're always visible. A left double-click resets the sheet's position. Fully customizable themes aren't implemented yet, but anti-aliasing and color inversion options are available. 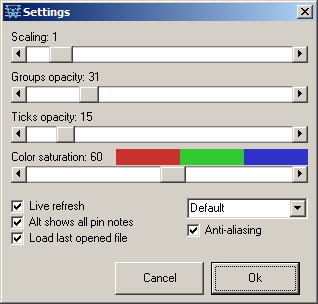 The color saturation setting can also be used to adjust readability. Time (or ticks) can be measured easily by "tracing a line" between two points with the right mouse button. Scaling: Stretch (or shrink) the sheet by this factor. Groups opacity: Group colored box opacity. Ticks opacity: Tick marks opacity (can be disabled). Color saturation: Sets how vivid colors are. A low setting results in almost grey. Live refresh: Automatically refresh the chronogram render while editing the definition. If disabled, refresh is done manually by pressing the F5 key. Alt shows all pin notes: When enabled, holding the ALT key shows all visible pin notes. Load last opened file: Does exactly that. Default / Inverted: Chose color scheme. Settings are saved when Waimea is closed. 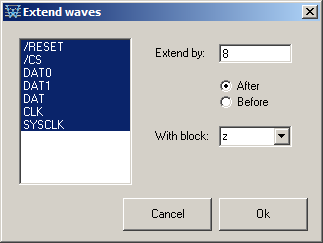 The Extend waves dialog is a beta feature meant to allow extending wave definitions easily and uniformly. It isn't well tested and can give unexpected results.